Hearst Castle Hearst Castle is a National and California Historical Landmark mansion located on the Central Coast of California, United States. It was designed by architect Julia Morgan between 1919 and 1947 for newspaper magnate William Randolph Hearst, who died in 1951. The California Park Commission voted to approve its inclusion in the California State Park System, which was approved by the California State Legislature in 1954 with a proposed admission charge of $1 per person [$9 adjusted for inflation] and a 50¢ bus ride. However, ironing out the details with the Trustees of the Hearst Estate and the Hearst Corporation took several years. The agreement was finalized in 1957, and it opened in 1958. Since that time it has been maintained by the Hearst San Simeon State Park where the estate, and its considerable collection of art and antiques, is open for public tours. Despite its location far from any urban center, the site attracts "millions of travelers each year." Hearst formally named the estate "La Cuesta Encantada" ("The Enchanted Hill"), but usually called it "the ranch." Hearst Castle and grounds are also sometimes referred to as "San Simeon" without distinguishing between the Hearst property and the adjacent unincorporated area of the same name. The term "Castle" is a bit of a misnomer when it refers to Hearst Castle, as it is a group of mansions. Invitations to Hearst Castle were highly coveted during its heyday in the 1920s and 1930s. The Hollywood and political elite often visited, usually flying into the estate's airfield or taking a private Hearst-owned train car from Los Angeles. Among Hearst's A-list guests were Charlie Chaplin, Cary Grant, the Marx Brothers, Charles Lindbergh, Greta Garbo, Joan Crawford, Clark Gable, James Stewart, Bob Hope, Calvin Coolidge, Franklin Roosevelt, Dolores Del Rio, and Winston Churchill. While guests were expected to attend the formal dinners each evening, they were left to their own devices during the day while Hearst directed his business affairs. Since "the Ranch" had so many facilities, guests were rarely at a loss for things to do. The estate's theater usually screened films from Hearst's movie studio, Cosmopolitan Productions. Hearst Castle was the inspiration for the "Xanadu" mansion of the 1941 Orson Welles film Citizen Kane, a fictionalization of William Randolph Hearst's career. 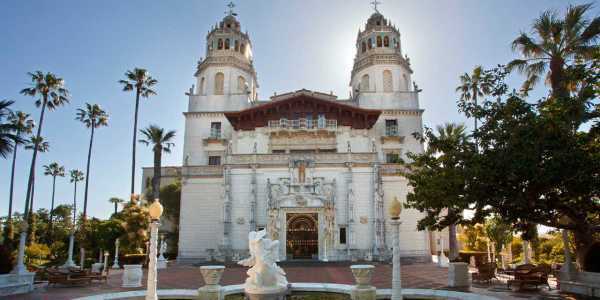 Hearst Castle was not used as a location for the film, which used Oheka Castle in New York, as well as buildings in San Diego's Balboa Park. 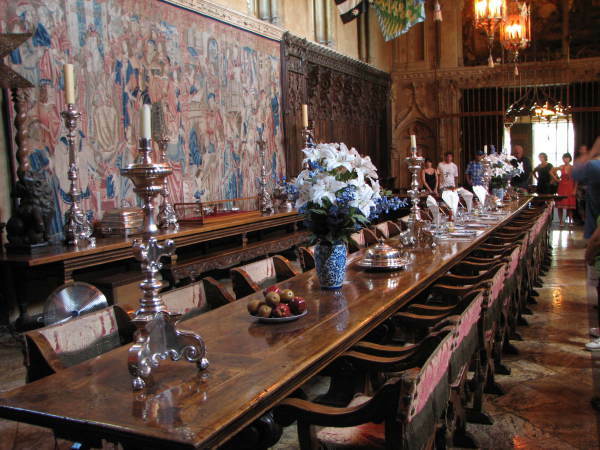 Commercial filming is rare at Hearst Castle, and most requests are turned down. Since the property was donated to the state of California, only two projects have been granted permission: Stanley Kubrick's Spartacus, which used the castle to stand in as Crassus' villa; and Lady Gaga's music video for "G.U.Y. Spanish style guest house, designed by Julia Morgan One condition of the Hearst Corporation's donation of the estate was that the Hearst family would be allowed to use it when they wished. Patty Hearst, a granddaughter of William Randolph, related that as a child, she hid behind statues in the Neptune Pool while tours passed by. Although the entire estate is now a museum, the Hearst family continues to use an older Victorian house on the property as a retreat – the original home built by George Hearst in the late 19th century. The house is screened from tourist routes by a dense grove of eucalyptus, to provide maximum privacy for the guests. In 2001, Patty Hearst hosted a Travel Channel show on the estate, and Amanda Hearst modeled for a fashion photo shoot at the estate for a Hearst Corporation magazine, Town, and Country, in 2006. Hearst Castle joined the National Register of Historic Places on June 22, 1972, and became a United States National Historic Landmark on May 11, 1976. 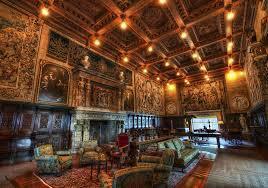 Hearst Castle was included as one of America's "10 Amazing Castles" by Forbes Travel.com. 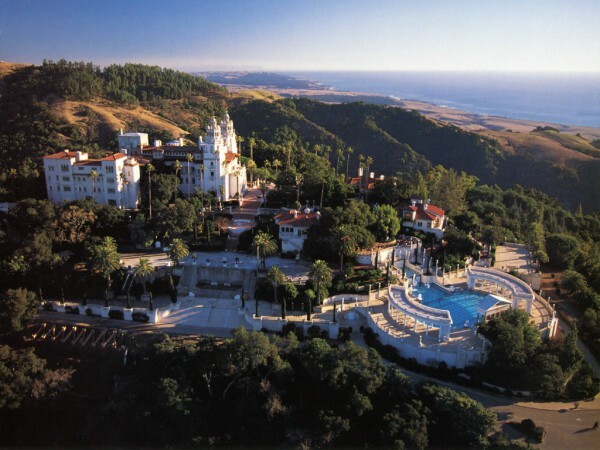 Forbes said, "Quite possibly the nation's most famous Castle, William Randolph Hearst went to great lengths to bring back the best of European architecture – most notably ceilings from churches and monasteries – which were pieced back together in California to create his highly eclectic Central Coast getaway.